South Africa’s role as host, in Durban, for the UN Framework Convention on Climate Change Seventeenth Conference of the Parties (COP 17) places the country in the spotlight, not just in terms of hosting the event, but also with regard to the role South Africa plays in both producing and mitigating carbon emissions. 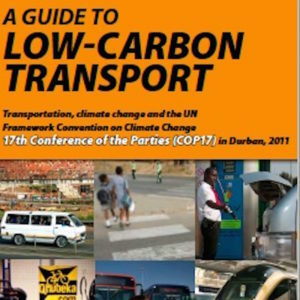 I published this guide to low-carbon transport to inform debate within the South African transport sector on the impact of transport on climate change and the potential for low-carbon and sustainable transport to mitigate climate change effects. The contents are by no means exhaustive, but should be seen as indicative of a number of the potential approaches that can be applied in urban areas to reduce consumption of fossil fuels, decrease emissions of greenhouse gases and contribute to more liveable cities. This document was prepared with financial assistance from the South African Sustainable Transport Project, an initiative of the South African Department of Transport, with grant funding from the Global Environment Facility and implementation assistance from the United Nations Development Programme. The Sustainable Transport Project has supported low-carbon transport projects in seven South African cities in the areas of Bus Rapid Transit, High Occupancy Vehicle Lanes and Non-Motorised Transport, together with a skills and capacity development programme. A number of these projects are described in this document.